Often called the father of anatomy. Herophilus of Chalcedon was a well respected physicians and teacher of medicine in Alexandria. Herophilus was born at Chalcedon, Greek city on the Propontus, nearly opposite to Byzantium. Herophilus received his early training as physician from Chrysippus, a widely known Stoie philosopher, who had taught at the school of Cnidus and had also written on medical topics. Herophilus showed a decided learning toward the study of anatomy. He was the pupil of Praxagoras of Cos. He was an original investigator and the first of the Hippocratic school to distinguish himself as an anatomist. 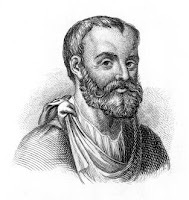 Herophilus lived during a period in Greek medical history when human dissection was allowed, and he greatly advanced the study of scientific anatomy through his extensive dissections of human cadavers. He experimented on living animals and even on condemned criminals placed at his disposal in the prisons. Some of the books written by Herophilus have been used for several centuries but only a few fragments from his texts have survived. He had a good picture of the nervous system, including the connection between the brain, spinal cord and nerves. He argued that the brain was the center of the nervous system, rejecting Aristotle’s claim that the heart was the seat of intelligence.